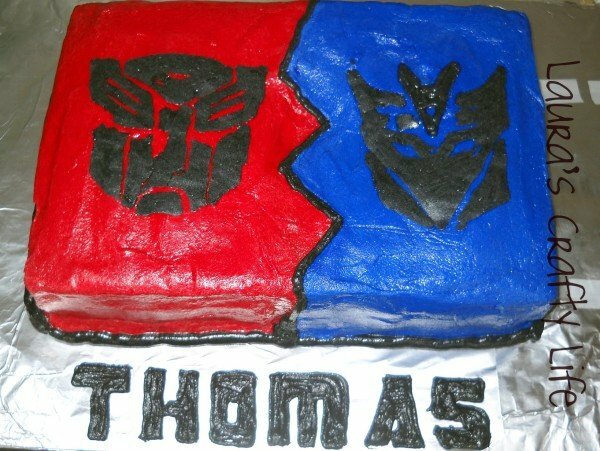 My son requested a Transformer party for his 4th birthday. I wanted to DIY as much as I could to save money and create a really special party for my son. I started by creating an invitation in Microsoft Word. 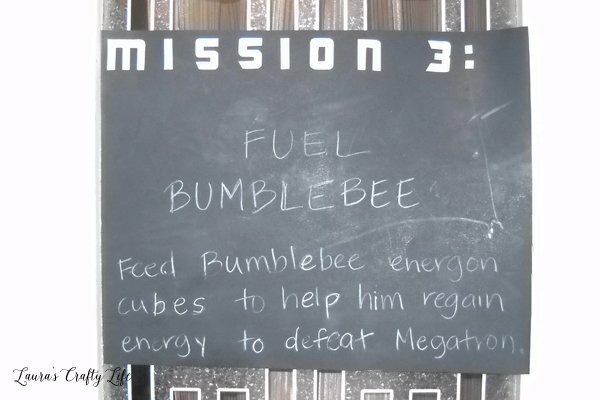 I used an image of his favorite character, Bumblebee, I found online. 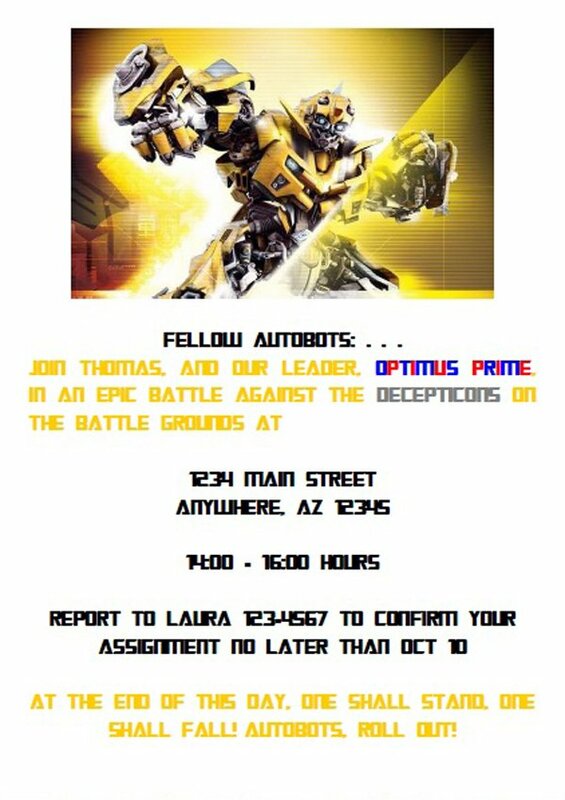 I then downloaded the Transformers movie font and used it for all the words on the invitation. I printed them on white cardstock as a 5″ x 7″ size invitation. I trimmed the excess paper with a paper trimmer. 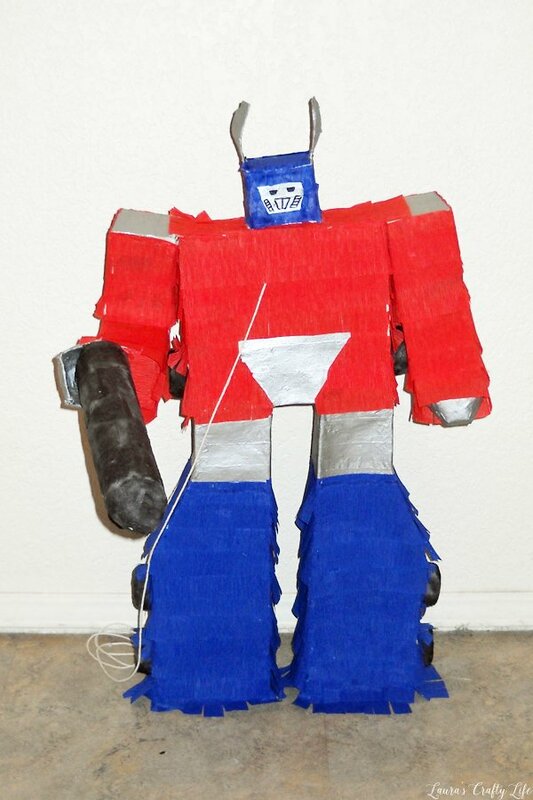 My next DIY was a handmade Transformers piñata. This little Optimus Prime was a labor of love. I cried a little inside when the kids when to town smashing him to pieces. I also created some fun party games. For one of them, I taped images I had found online of the Decepticons onto our outdoor plastic bowling set. The goal was to knock down as many pins as you could. Another game was a toss game. We used little bean bags and the kids had to toss them into Bumblebee’s mouth. The bean bags represented Energon cubes. 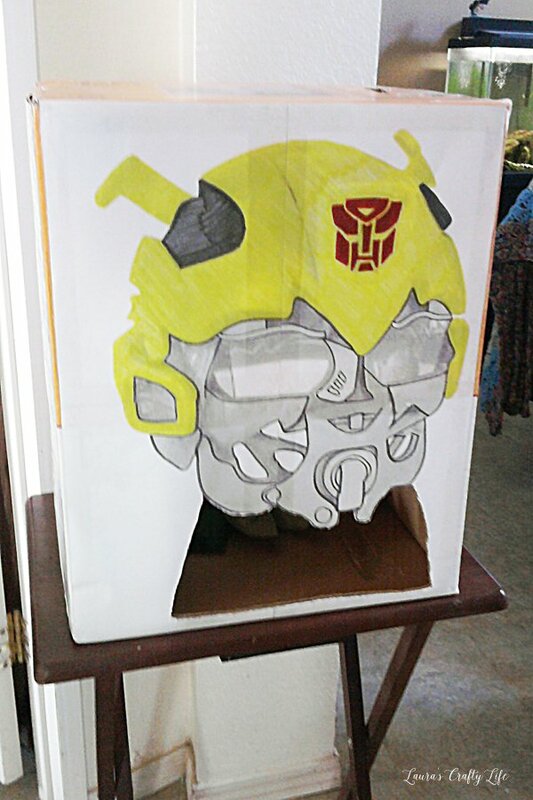 To create Bumblebee’s head, I enlarged an image I found of him and printed it on four sheets of printer paper. Using tape, I assembled the image and colored with markers. Then, I attached the image to a large cardboard box. I trimmed the mouth area with a utility knife to have a place to toss the bean bags into. I also cut a hole in the back to be able to easily retrieve the bean bags. 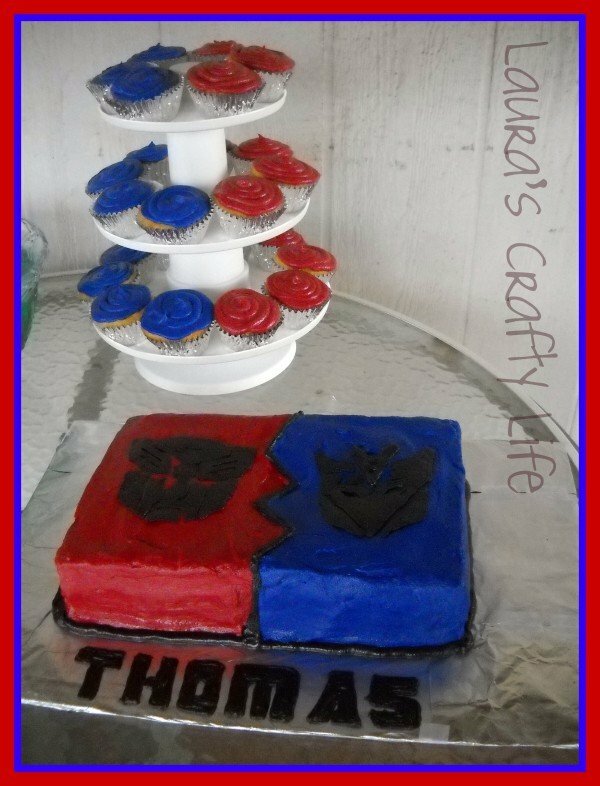 To create the cake, I started with a standard 13″ x 9″ sheet cake. 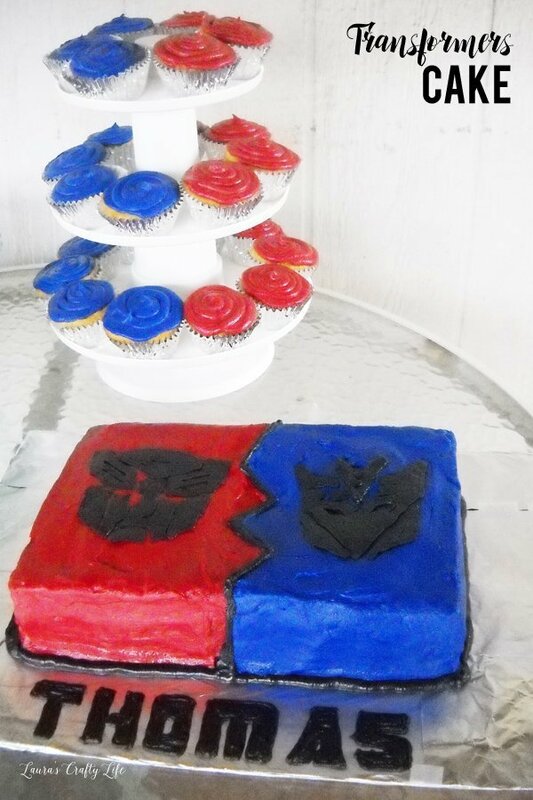 I used Wilton’s icing colors to color the buttercream frosting red and blue. To create the ‘Autobot’ and ‘Decepticon’ logos, here are the steps I took. STEP ONE: Find the images you want to use and print them out on plain paper. STEP TWO: Make and color your buttercream icing (I use Wilton’s buttercream icing recipe). STEP THREE: Turn a cookie sheet or sheet pan upside down and tape your images to it. Then, tape down waxed paper over the images. STEP FOUR: Use a small round icing tip to trace the designs and fill them in on the waxed paper using the images as a guide. STEP FIVE: Put the sheet pan into the freezer. After the design is frozen and your cake is iced, carefully lay the wax paper (icing side down) onto the iced cake. Carefully peel back the wax paper to transfer your design to your cake. I tried this same technique to do the ‘Thomas’ lettering, but for some reason, it would not transfer properly to the foil, so I had to free hand it! We had such a fun time! I was so happy I was able to create such a fun party for him.